The National Day Awards are a means of recognising various forms of merit and service to Singapore. This year, a total of 3010 individuals in 21 award categories received National Day Honours. Gain insider views from your peers who had worked in Credit Suisse/Exxon Mobil/Bloomberg/Lonza/SPH & more at Career Discovery 2011! Grab a copy of our industry factsheet which covers 19 industries, including Banking and Finance, Civil Service, FMCG, Media, Tourism, Social Service and more at the event! 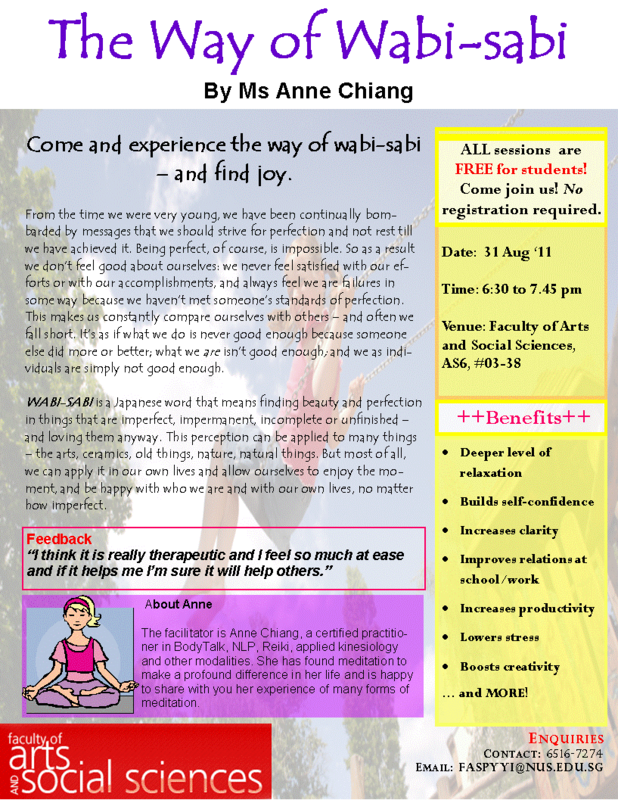 Come and experience the way of Wabi-sabi – and find joy! 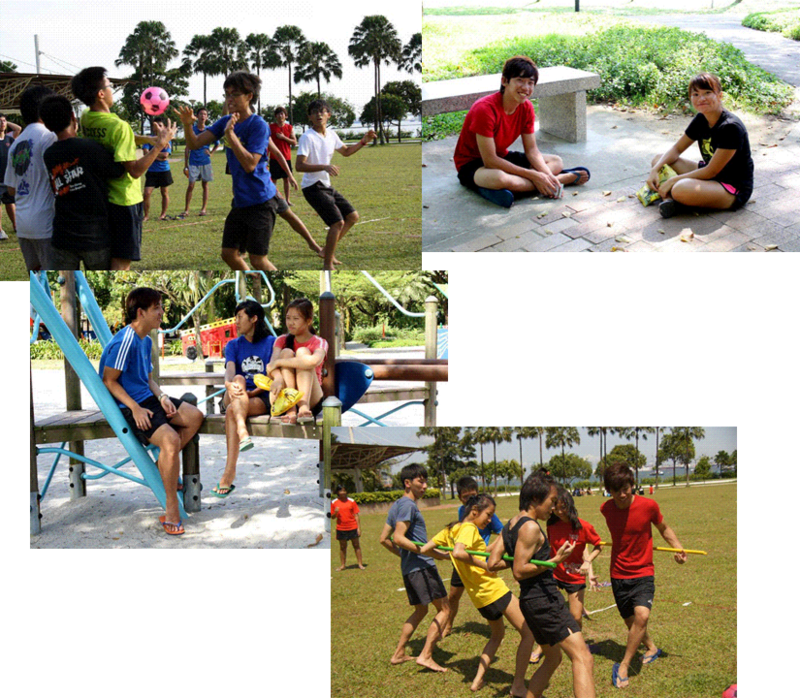 This year, ENS held its annual freshmen orientation camp from the 11th to the 13th of July. The camp was centered around the theme : “Battle Royale”, and both freshmen and seniors alike were treated to a unique 3-day, 2-night experience, which captured entertaining elements from the Japanese movie, which inspired the selfsame theme. 42 students- isolated in an island, who are forced to kill each other until there is only one survivor left. As such, incorporating the concept of a “battle” from the movie , the four OGs (Orientation Groups) were likewise forced to “fight” at station games, competing for supremacy in the form of game points and power-ups. The accumulation of points and power-up tokens would ultimately determine a single winner. Each day had different power ups, which was supposed to symbolise the different weapons allocated to the different students. Of course, the OGs were named in accordance with the theme- Kamikaze, Bankai, Ninja, and Yakuza! One memorable aspect of the station games involved our very own NUS central library, with the librarians specially preparing a “missing-person mystery” for our freshmen to solve, aimed at familiarising them with our online and literary resources. At night, the freshmen were paired into couples, and in some cases, triplets- (as the demand for male freshmen exceeded supply for male freshmen, with regards to the allocation of couples), and they were treated to a night “mystery forest/graveyard walk” in their respective pairs/triplets. Snakes (toys), Rain (water from water guns) Rustling branches (operated by the councilors) and wild animals (the seniors) were several “obstacles” encountered by the freshmen as they walked through the “forest” to get to their final destination. After all the excitement, everyone went to bed in anticipation for the next day. The second day started off officially at the end of the sponsorship talks, when the Publicity Head put on an impromptu skit with several of the other OGLS (Orientation Group Leaders). The OGs were soon sent off on an amazing race taking place around Haw Par Villa, with each OG finding hidden clues, doing group actions, and taking photographs together. 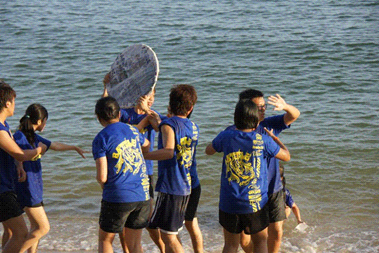 This concluded at Sentosa’s Palawan Beach, the location of our Beach games. The sand, the sun, the sea- elements needed for a perfect Summer day-, was present in full force as each OG shuffled between stations, playing games to earn points and power-ups. The freshmen played versions of volley-ball, dog-and-bone, and took part in a mini obstacle course, which culminated in a mass water bomb battle. 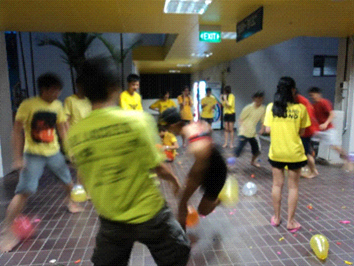 Chaos reigned supreme as the Organising Committee was pitted against the four OGs, with water bombs flying everywhere. There was no official winner (of this battle), but good memories- as the entire Camp sang the camp song together, swaying in tune to the music at the final segment. At night, the freshmen were treated to a round of SP games, as they were blindfolded in their respective pairs/triplets. Facilitators walked among them, giving instructions as they were treated to a variety of exciting games- identifying “mystery sauces” by taste, dancing to music, styling each other’s hair, drawing each other’s portrait, and answering questions posed to each other while armed with water guns. The last day started off on a rather hectic note, as the freshmen were shuttled off to West Coast Park immediately after checking out from Kent Ridge Hall. Despite the activities of the previous two days, the games planned were comparatively more demanding, ranging from a 45-minute game of Frisbee, Football (where the freshmen were divided similarly to the formation found in table soccer, with each trio/quadruplet holding a pole behind their backs, and forced to move in unison), to an extended game of tag. The highlight- the Battle Royale Cup finale, where Kamikaze and Bankai fought it out in a game of Captain’s Ball, which eventually became a melee of sorts. As it was the last day, lunch was a scrumptious buffet spread, with the cold drinks served as a thirst quencher for many tired and hot freshmen. The day culminated with the SP revelation- as each pair/trio took off their blindfolds, and were given quality time to interact, surrounded by lush greenery, the sweet sounds of the waves, a cool breeze (considering that It was in the late afternoon).. and one another. It was rather heartening to see each couple/triplet talking to each other earnestly, despite the short span of three days. Hopefully, long-lasting friendships were formed. 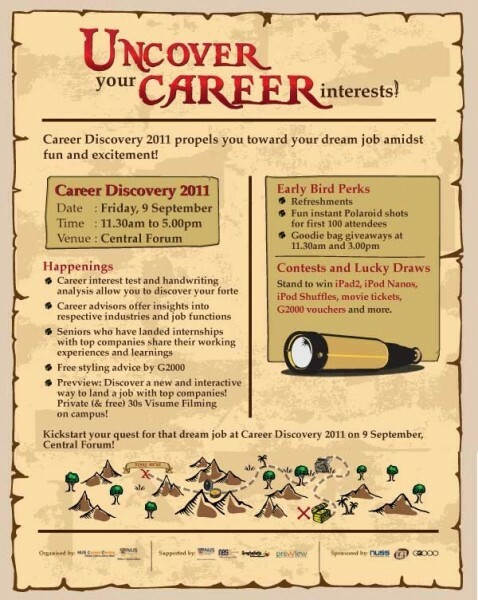 Some jobs are merely those: jobs. They require you to drag yourself up from bed every morning to another dull day of work, where you deal with task after dreary task. In exchange for undergoing this daily routine that leaves you drained of your energy every time, you get to make a steady income and to lead a stable, secure life. 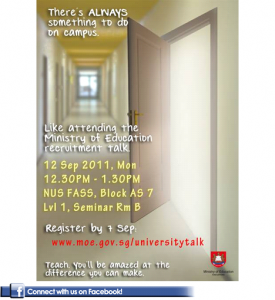 Come join us for our upcoming MOE Recruitment Talk for Year 3 & Year 4 students on 12 Sep 11, 12.30PM – 1.30PM at FASS Block AS 7, Level 1, Seminar Room B. 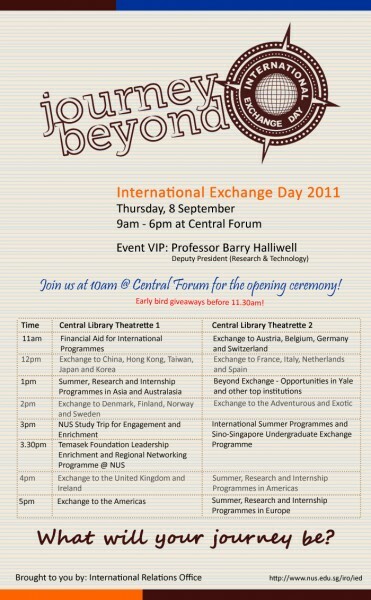 Please register your attendance at www.moe.gov.sg/universitytalk by 7 Sep.
Click here to Connect with MOE on Facebook. 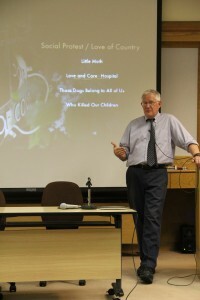 On August 22nd the Department of Social Work held the second Ee Peng Liang Memorial Fund Forum. The Guest-of-Honour for the Forum was BG (NS) Tan Chuan-Jin, Minister of State for Manpower and National Development. 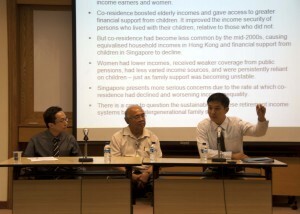 NUS alumnus Mr Ng Kok Hoe, who was awarded the Ee Peng Liang Memorial Fund Scholarship last year to pursue his PhD in Social Policy at the London School of Economics, presented some findings from his research, titled “Old-age income security and intergenerational co-residence in Hong Kong and Singapore”. In a very thorough and clear presentation, Mr Ng discussed how the sources of income and the living arrangements for the aged in Singapore and Hong Kong have changed between the mid-1990s and mid-2000s. Mr Ng noted that the aged who live with their children are more financially secure. However the number of elderly living with their children here is going down; as Singapore’s retirement income system is built on inter-generational family support, he said, the sustainability of the current system, particularly related to CPF, is in doubt. Some of the more shocking findings showed the income and assets disparity between the sexes going into retirement. Guest-of-Honour , BG (NS) Tan Chuan-Jin, spoke on meeting the challenge of securing retirement adequacy in the face of an ageing population. He remarked that Mr Ng’s presentation broughtup some interesting issues which will be further analyzed by policy makers. Mr Gerald Ee, Chairman of the National Kidney Foundation and son of the late Mr Ee Peng Liang, also spoke on the hopes for his father’s legacy. 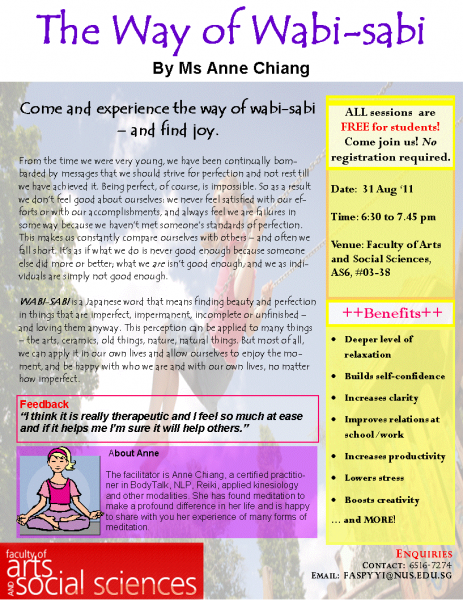 The event is named after the late Dr Ee, widely acknowledged as Singapore’s Father of Charity and a founder member of what is today called the National Council of Social Service, and the Community Chest. 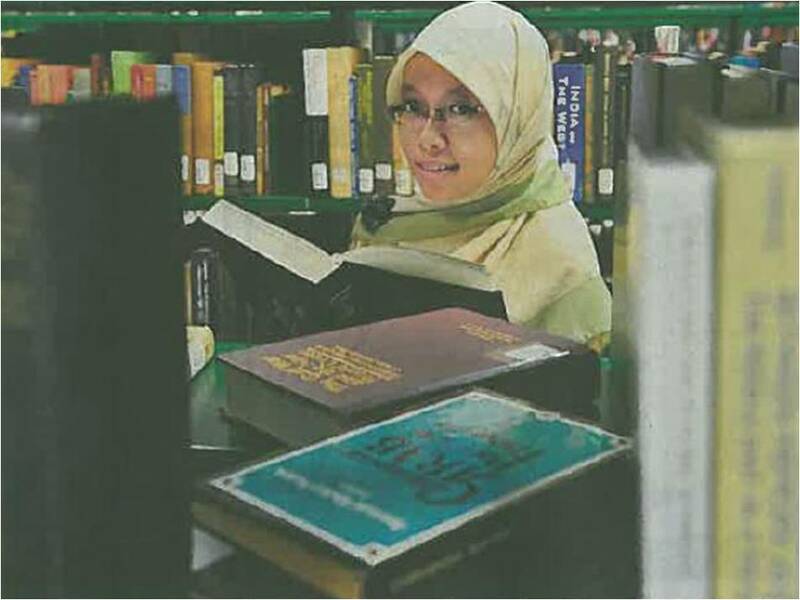 NUS Malay Studies major Ms Norhafizah Mabdi was recently awarded the Berita Harian/Berita Minggu Gold Medal Award for her outstanding academic performance and emerged as the top student in Year 3 majoring in Malay Studies. Ms Norhafizah is also a Ministry of Education Award recipient. She was part of the Malay Elective Programme at both Secondary School and Junior College level at Bukit Panjang Govt High School and Innova Junior College respectively. The jovial and fluently multilingual Professor Pickowicz commenced his talk by sharing how the liberation of the Chinese film movement runs the entire gamut, percolating down to even underground amateurs. He then went on to suggest that this is but an unapologetic reflection of the increasing democratisation of culture in modern China. Indeed, the subjects explored in these independent films are, by and large, starkly anti-conformist, centering on issues that the state sector refuses to address. They often focus on the savagery of the human condition and the gritty underbelly of society, foregrounding an array of topics such as environmental degradation, corruption, organised crime, all aspects of human sexuality, prostitution, gang violence and drug abuse. Professor Pickowicz then proceeded to show to the engrossed audience some clips from various independent Chinese films – some humorous, some graphically explicit, but all undeniably and incredibly raw and illuminating. One of the more memorable clips, from the controversial (and de facto banned) film Summer Palace by Lou Ye, reenacts the brutality of the Tiannanmen Square protests of 1989. Another clip, from a documentary entitled A Day to Remember, showcases amusing yet poignant footage of civilians refusing, point-blank, to discuss the said protests on camera. Yet another clip, from the film These Dogs Belong to all of Us, cleverly employs dogfights as a metaphor for human savagery. After screening the various clips, Professor Pickowicz moved on to assert that these independent filmmakers do not actually see themselves as dissidents, thereby dismantling the popular binary assumption that pits so-called courageous rebels against a repressive state. Instead, he posits that such filmmakers should be seen as being involved in an elaborate dance of sorts with the state, using subtle methods to foreground the aforementioned taboo topics and pique societal conscience. He then summed up his engaging presentation by concluding that independent filmmaking in China is indeed a labour of love; it demonstrates the filmmakers’ artistic license and genius, as well as their heroic attempts to underscore the multifarious aspects of human society. Furthermore, he confidently announced that independent filmmaking is here to stay, what with such films receiving increasingly more attention from scholars, as well as a growing domestic and foreign audience. Indeed, in the wake of his stimulating talk, independent Chinese filmmaking may just have won over quite a few more fans! Professor Paul G Pickowicz is a Distinguished Professor of History and Chinese Studies at the University of California, San Diego, and the inaugural holder of UC San Diego Modern Chinese History Endowed Chair. His books include Chinese Village, Socialist State (Yale, 1991), New Chinese Cinemas (Cambridge, 1994), Revolution, Resistance and Reform in Village China (Yale, 2005), The Chinese Cultural Revolution as History (Stanford, 2006), Dilemmas of Victory (Harvard, 2007), and China on the Margins (Cornell, 2010). Moreover, he has won three distinguished teaching awards, namely, the UC San Diego Alumni Association (1998), Chancellor’s Associates (2003), and Academic Senate (2009). The talk in question is just one of the many items on Professor Pickowicz’s agenda during his term at FASS. Besides this talk, he also hopes to complete some work on a new book entitled China on Screen: A Century of Exploration, Confrontation and Controversy, as well as begin a conference paper entitled “What’s so Funny? Cyber Humor in Contemporary China.” Together with Dr Nicolai Volland of the Department of Chinese Studies, he will also co-chair a four-part workshop on Chinese filmmaking in Shanghai during the War Years (1938-1945). 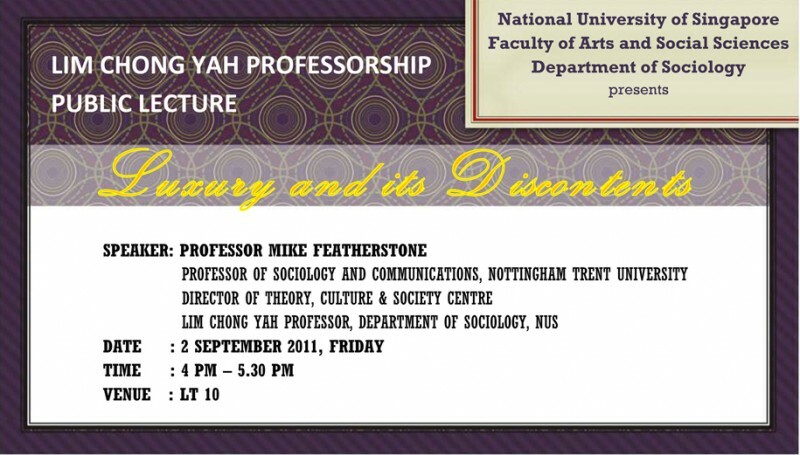 The Faculty of Arts and Social Sciences’ Distinguished Leaders in Asian Studies speaker series presents cutting-edge research by top international scholars in Asian Studies. The FASS’s research agenda in Asian Studies emphasises comparative and inter-Asia studies drawing on strong located knowledge in the regions of South, Southeast and East Asia in particular. The special series capitalises on FASS’s extensive research networks to publicise the work of top international scholars in Asian Studies. The production of an expanding range of consumer goods and luxuries is generally seen as one of the main engines driving the global economy. Contemporary consumer culture and media advertising reveal an endless fascination with the luxurious lifestyles of celebrities and the super-rich. If luxury is central to social life today, we should be aware that for much of western history up to the eighteenth century, luxury has been depicted as a dangerous thing, corrosive of morality and social order. The lecture will examine a number of luxury dynamics, some of which point not merely to the control of luxury, but to the transformation of luxury, to potential moves beyond luxury. If the moral containment or eradication of luxuries has historically been a powerful dynamic, there are a number of other vectors to be considered. These include: the democratisation of luxury; austere luxury; connoisseurship; the shift from material to immaterial luxuries; the move from sensual pleasures to more contemplative recollections and mediations. The various dynamics in their different ways, seek to acknowledge, play with, or go beyond, the imputed power of the luxury object and the crossovers between art, luxury, imagination and everyday life.